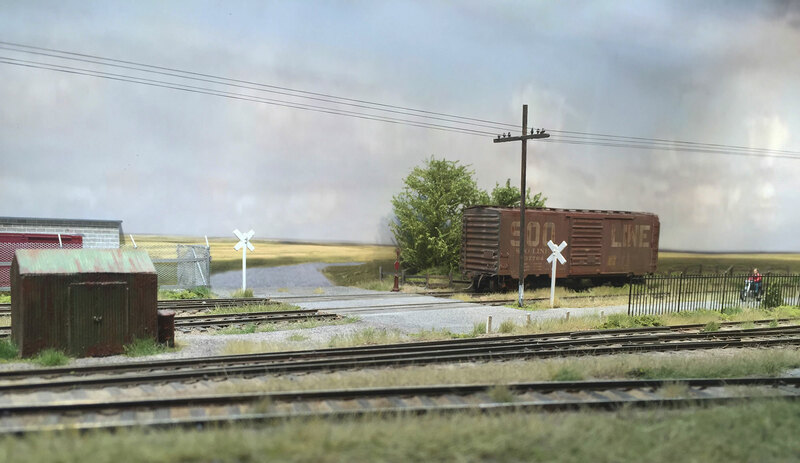 I wanted to model track vignettes – little scenes where I could explore the rapid changes that occur from tie to tie. Three ties may be split or moved over to an angle, others may have been splintered. Dust may have stained a few more and vegetation might have spread across another group. I wanted to model all these effects. I built series of small testing platforms in order to work on short stretches of track. They were made of foam board and no other support. Once glue goes down on these boards they can warp but these pieces are so small (5.5 inches by 3 inches) that any warping was not noticeable. But before starting I did two important things – I studied real track and I gathered real materials from a real trackbed in my area. 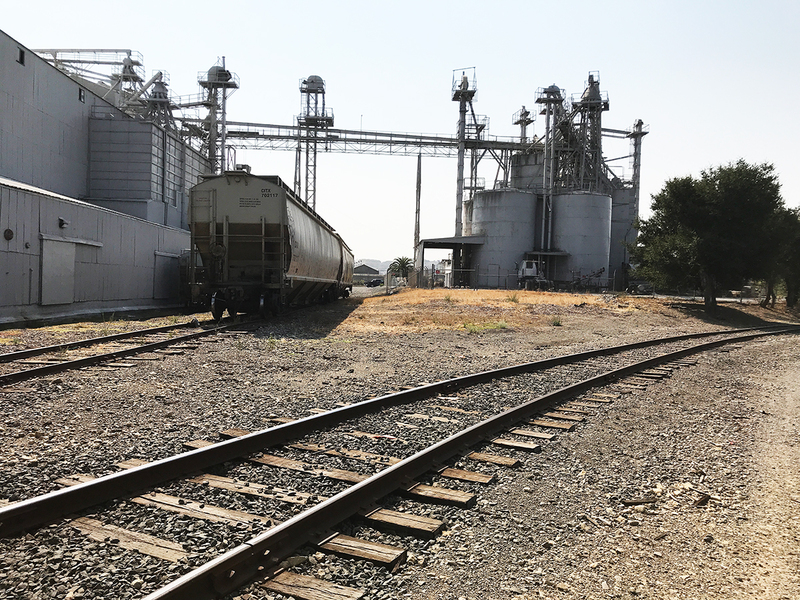 I traveled to Petaluma – a town forty miles north of San Francisco – where the railway line that had shut down for many years resumed business a few years ago. The local railway line services a bunch of different industries but most importantly the track has only partially been rehabilitated. 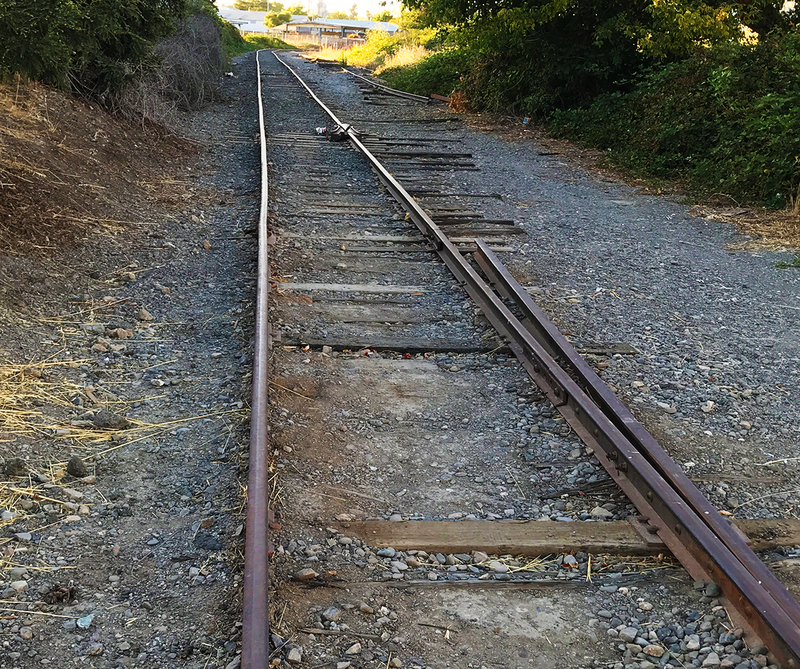 In other words much of the original trackwork remains in place and is old, rusty, dirty, grown over and sunken in the soil – just the kind of track I wanted to model. 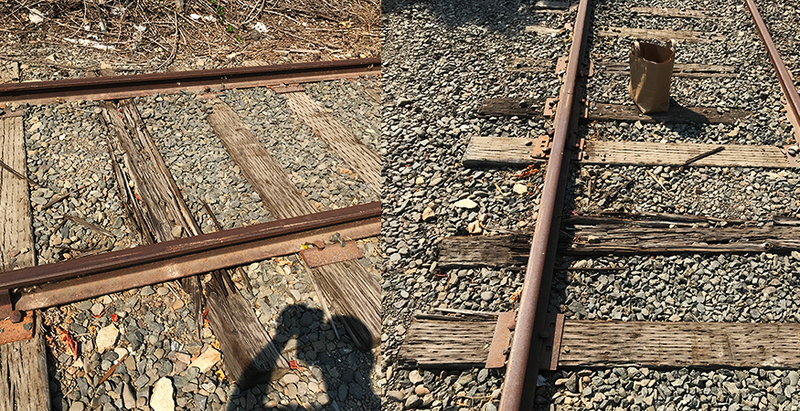 This was the sort of thing I was looking for: dirty worn track with plenty of weathering action from tie to tie. This is the head-shunt for the local grain (feed?) elevator. I took along a bunch of glass jars and my trowel to gather materials. I figured what better material to use than the actual material I was trying to model. Real materials can scale really well and look convincing if broken down and scaled to the correct model size. Rocks, sand, stones, even some plants – once sifted and measured – look just like the real thing. By the way, next time I will take my soil sifting pans so that I don’t end up with jars full of large stones as I had to pick them out of the soil and dirt I gathered – very time consuming. 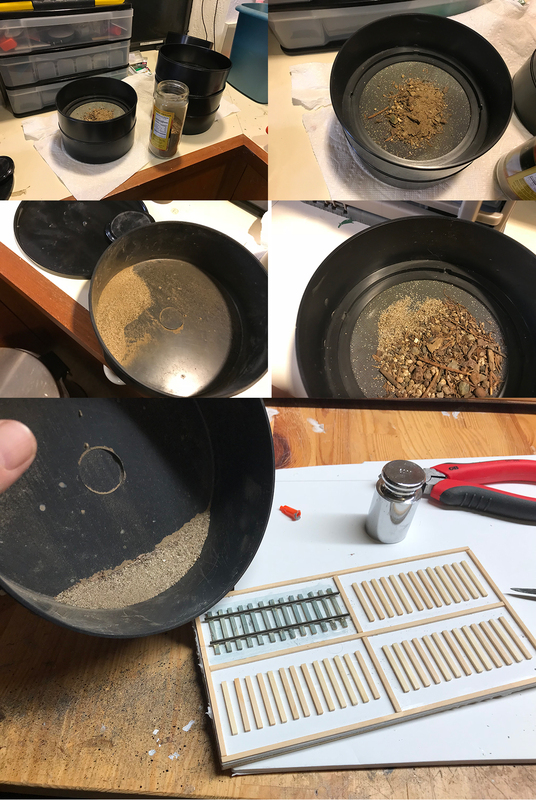 I gathered a variety of materials including some bonfire dust -a material I didn’t think I would have any use for but turned out to be the best of all the materials I gathered. 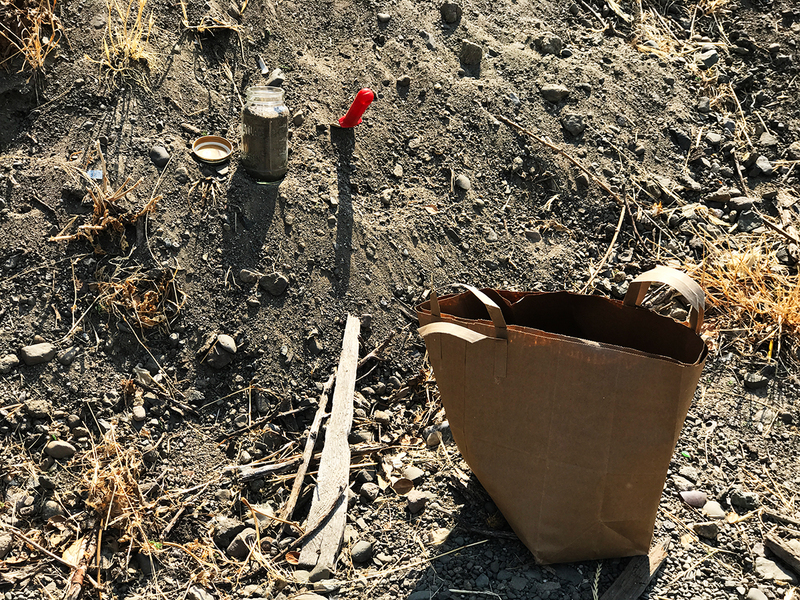 My paper bag contained around six or seven glass jars that I filled with materials around the trackbed. 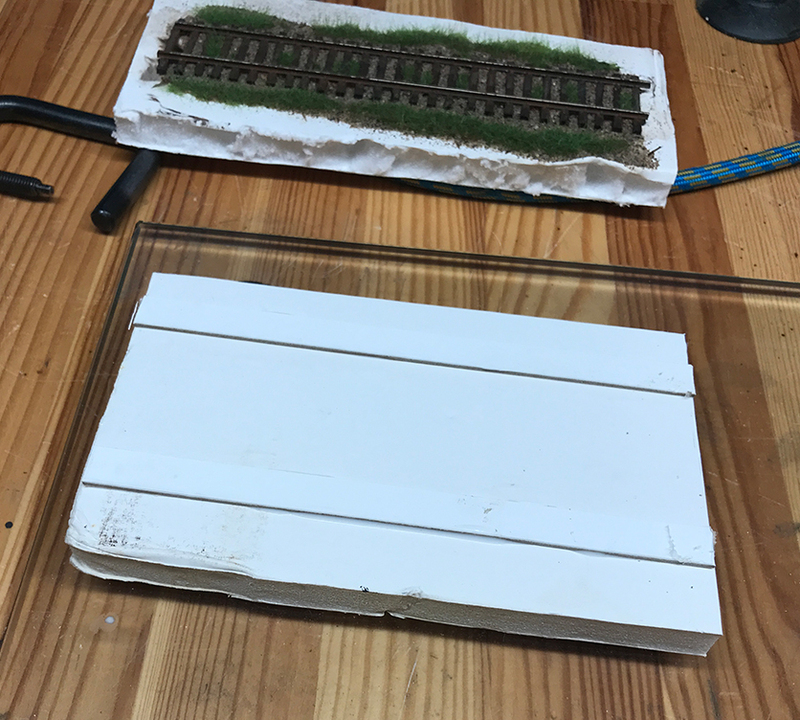 I also took a bunch of close up photos of the trackbed – real track vignettes – to refer to and keep me focused on the prototype and to observe the way that real track and dirt and soil behave over time. I’ve started collecting these vignettes as I find them very aesthetically pleasing. Track vignettes. I’ve started collecting little scenes like this. I’m particularly interested in split ties. I made a note of the location so that I could come back any time to refill my materials chest. I added the materials to my collection – the photo shows about a third of it. The idea is to have a variety of colors, textures, and weights. The way to use them is to sift and blend to create unique combinations – all to model the prototype. Once home I sifted the soil and dirt into different grades to start the project.